Health insurance is a term commonly used to describe any program that helps in the payment of medical expenses. There are a number of forms of health insurance that exist in the United States; the main forms include varieties of private and public coverage. 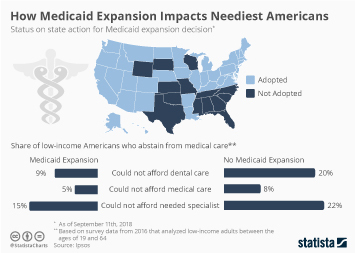 There are social welfare programs such as Medicaid in place in order to provide assistance to people who are unable to afford health coverage. The number of uninsured people fell significantly since the ACA was signed in 2010, but then leveled off in 2017. However, Hispanics and Blacks are still the most uninsured ethnicities in the U.S. In 2017, 28.6 percent of Hispanics were uninsured. Enrollment in Medicaid is on the rise, which provides health care to low-income citizens or lawful permanent residents. Enrollment in 2018 was estimated to be 74.8 million. The number of Americans with private health insurance began to fall in the late 1990s and early 2000s, but the numbers have been rising slowly again since 2013. In 2017, 62.6 percent of Americans had private health insurance. Public opinion on ACA has been split down the middle since it was enacted in 2010. As of January 2019, 51 percent of Americans had a favorable opinion of it, whilst only 40 percent had an unfavorable opinion of it. Generally Democrats want ACA to be expanded or kept the same, whereas Republicans overwhelmingly want it to be repealed.